In the summer of 2003, NASA launched identical-twin Mars rovers that were to operate on the surface of the Red Planet during 2004. Spirit (MERA) was launched by a Delta II rocket from Cape Canaveral on June 10, 2003, and successfully landed on Mars on January 4, 2004. Opportunity (MER-B) was launched from Cape Canaveral on July 7, 2003, by a Delta II rocket and successfully landed on the surface of Mars on January 25, 2004. Both landings resembled the successful airbag bounce-and-roll arrival demonstrated during the Mars Pathfinder mission. 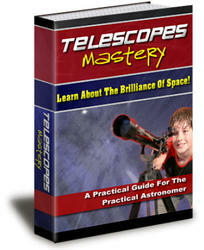 function and move across Mars far beyond the primary mission goal of 90 days. In early October 2006, NASA's long-lived robot rover Opportunity began to explore layered rocks in cliffs ringing the massive Victoria Crater on Mars. While Opportunity spent its first week at the crater, the Mars Reconnaissance Orbiter (MRO)—NASA's newest eye in the Martian sky—imaged the hardy rover and its surroundings from above. NASA mission controllers used the MRO's high-resolution imagery to help guide Opportunity as it explored Victoria Crater. The efficient and timely blending of data from both robot systems is an excellent example of more-efficient planetary exploration through the integration of orbiter and lander/rover spacecraft. Exposed geological layers in the clifflike portions of the inner walls of Victoria Crater appear to record a longer span of Martian environmental history that the rover has studied in smaller craters. With much greater mobility than the Mars Pathfinder minirover, each of these powerful new robot explorers has successfully traveled up to 330 feet (100 m) per Martian day across the surface of the planet. Each rover carries a complement of sophisticated instruments that allows it to search for evidence that liquid water was present on the surface of Mars in ancient times. Spirit and Opportunity have visited different regions of the planet. Immediately after landing, each rover performed reconnaissance of the particular landing site by taking panoramic (360°) visible (color) and infrared images. Then, using images and spectra taken daily by the rovers, NASA scientists at JPL used telecommunications and teleopera-tions to supervise the overall scientific program. 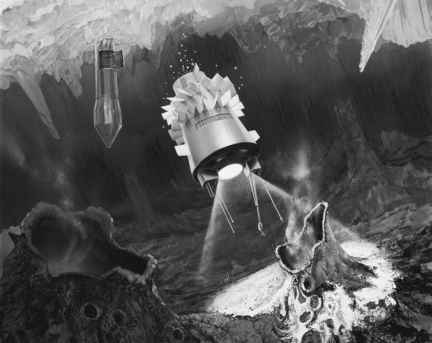 With intermittent human guidance, the pair of mechanical explorers functioned like robot prospectors—examining particular rocks and soil targets and evaluating composition and texture at the microscopic level. Within two months after landing on Mars, Opportunity found geological evidence for an ancient Martian environment that was wet. Each 407-pound (185-kg) rover has a set of five instruments with which to analyze rocks and soil samples. The instruments include a panoramic camera (Pancam), a miniature thermal emission spectrometer (Mini-TES), a Mossbauer spectrometer (MB), an alpha particle X-ray spectrometer (APXS), magnets, and a microscopic imager (MI). There is also a special rock abrasion tool (or RAT) that allowed each rover to expose fresh rock surfaces for additional study of interesting targets. the surface of the Red Planet. Their unexpected longevity has provided NASA engineers a unique opportunity to field-test new capabilities. 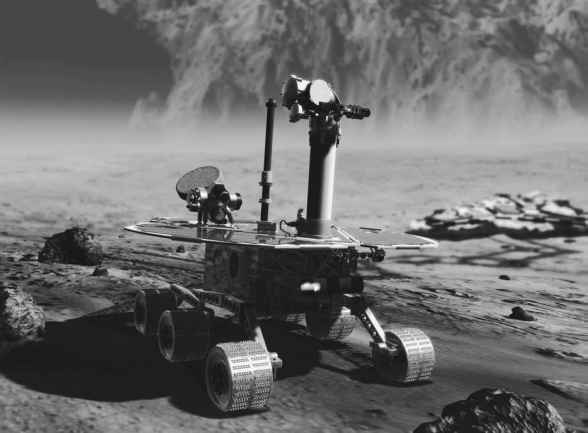 The extraterrestrial field tests not only helped improve the performance of the current rovers but also exerted influence on the design and performance of future rover systems. Specifically, both hardy rovers are testing four new skills that NASA engineers uploaded into their onboard computers. One of the new capabilities enables each robot spacecraft to examine collected images and recognize certain features. Another new capability, visual target tracking, enables a moving rover to keep recognizing a designated landscape feature. With this capability, although the shape of a target rock may look different from a different angle, the robot rover now "knows" it is approaching the same (target) rock. The new software also improves the autonomy of each rover and helps it avoid potential hazards. Now, while wandering through potentially hazardous terrain, each rover can "think" several steps ahead. As of the end of January 2007, Spirit and Opportunity have operated on the surface of Mars for nearly 12 times as long as their originally planned prime missions of 90 Martian days. Spirit has driven about 4.3 miles (6.9 km) and Opportunity about 6.1 miles (9.9 km). Spirit has discovered evidence that water (in some form) has altered the mineral composition of certain soils and rocks in the older foothills above the plain where the rover landed. Opportunity's key discovery since landing on Mars has been the collection of mineral and rock-texture evidence, which strongly suggests that water flowed over the surface and drenched at least one region of the Red Planet long ago.